ArcelorMittal (Euronext: MT, NYSE: MT, BMAD: MTS, LuxSE: MT) is the largest steel company in the world, with 310,000 employees in more than 60 countries. It has led the consolidation of the world steel industry and today ranks as the only truly global steelmaker. The company was formed in 2006 by the merger of Arcelor and Mittal Steel. It ranks 39th on the 2008 Fortune Global 500 list. The company is headquartered in Luxembourg City, the former seat of Arcelor. Under the leadership of Lakshmi Mittal, ArcelorMittal originated from a small steel manufacturing company in India and expanded internationally, acquiring steel plants in Asia, Latin America, Europe and the United States. ArcelorMittal is an example of the globalization taking place in many areas of industry today. By consolidating many individual steel producers under a single administration, ArcelorMittal is able to remain competitive by making its manufacturing, marketing and shipping operations as efficient as possible. Excessive manufacturing capacity in one country can be redirected to fulfill the demands of another area; products can be manufactured where the cost is lowest and shipped to where they are needed; successful innovations can be implemented worldwide; redundant research and development work can be eliminated; and engineering costs lowered as resources are shared. Consolidation and globalization have been facilitated by the growth of the Internet, which makes information immediately available worldwide. After the merger in 2006, however, ArcelorMittal faced considerable challenges coordinating the work of three hundred thousand employees in sixty countries, reconciling cultural differences, and establishing a system of communications among them. ArcelorMittal is a market leader in automotive, construction, household appliances, and packaging. It holds sizeable captive supplies of raw materials and operates extensive distribution networks. ArcelorMittal key financials for 2007 show revenues of US$105.2 billion, with a crude steel production of 116 million tonnes, representing around 10 percent of world steel output. ArcelorMittal is listed on the stock exchanges of New York, Amsterdam, Paris, Brussels, Luxembourg and on the Spanish stock exchanges of Barcelona, Bilbao, Madrid and Valencia. As of May 17, 2008, the market capitalization of ArcelorMittal was $144.37 billion. Lakshmi Mittal, Chairman of the Board of Directors and CEO of Mittal Arcelor. Lakshmi Narayan Mittal (Hindi: लक्ष्मि नारायण मित्तल), Chairman of the Board of Directors and CEO of Mittal Arcelor, was born June 15, 1950, in Sadulpur village, in the Churu district of Rajasthan, India, in an Agrawal family. During his childhood, he lived with his extended family in a house built by his grandfather with bare floors and rope beds. His grandfather worked for Tarachand Ghanshyamdas Poddar, one of the leading industrial firms of pre-independence India. Mittal’s father, Mohan Mittal, established a steel mill in Hardoi, Uttar Pradesh. Eventually the family moved to Calcutta where his father became a partner in a steel company and made a fortune. 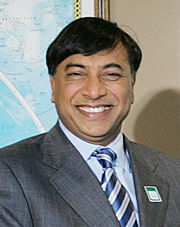 Lakshmi Mittal graduated from St. Xavier's College in Calcutta with a Bachelor of Commerce degree in Business and Accounting in 1969, and began working in the family business. In 1976, when the family founded its own steel business, Mittal set out to establish its international division, beginning with the buying of a run-down plant in Indonesia. Shortly afterwards he married Usha, the daughter of a well-to-do moneylender. He continued the international expansion of the company with the acquisition of Iron & Steel Company of Trinidad & Tobago in 1989, Sibalsa in 1992, and Sidbec-Dosco in 1994. In 1994, after a disagreement with his father, mother and brothers, Lakshmi Mittal branched out on his own, taking over the international operations of the Mittal steel business. He had successfully turned around several loss-making steel plants in several countries, and one of his ambitions was to become the leading steel producer in Europe and dominate the market for high-quality wire rods, extensively used for automotive manufacturing and other sophisticated applications. In 1994, Mittal acquired Hamburger Stahlwerke (HSW) in Germany from the Hamburg government, forming Ispat International Ltd. and Ispat Shipping. Mittal acquired Karmet in 1994 and Irish Steel in 1995. In 1997, Ispat International NV became a public company. In 1998, it acquired Stahlwerk Ruhrort and Walzdraht Hochfeld, two long-products mills in Germany, from Thyssen Krupp; and the France-based Unimetal Group from Usinor in 1999. With this acquisition, Ispat became Europe's largest producer of high quality wire rods. By acquiring poorly run plants at very low prices, Mittal invested less for each tonne of steel-making capacity than any other firm in the world. He then cut purchase costs, laid off redundant workers, invested in enhanced productivity, and streamlined sales and purchasing efforts to make them profitable. Analysts estimated that Ispat was spending half of what it would have cost to build new steel plants. By 2000, Ispat's integrated mini-mills were the largest producer of direct reduced iron (DRI) in the world. Ispat had significant strategic interests in iron ore mines, pelletizing facilities and deep-water port facilities, and a broad portfolio of flat and long steel products including high quality cold rolled, electrogalvanized and coated steels, slabs, special quality bar products and wire rods. Ispat sold its products to customers across 55 countries. In 1998, Ispat made its first U.S. acquisition, Inland Steel Company, for $888 billion. It continued its expansion by purchasing Unimétal in (1999). As the U.S.S.R. dissolved and former state-run industries in many countries were privatized, Ispat took advantage of the opportunity to purchase existing steel mills at bargain prices. It acquired ALFASID (Algeria, 2001) and Sidex (Romania, 2001), signed a business assistance agreement with Iscor, and acquired Nowa Huta (Poland, 2003), Polskie Huty Stali (Poland, 2004), BH Steel (2004), and Macedonian facilities from Balkan Steel (2004). In 2004, when Ispat International N.V. acquired LNM Holdings N.V. (already controlled by Lakshmi Mittal) and merged with International Steel Group Inc. (the remnants of Bethlehem Steel, Republic Steel and LTV Steel), Mittal Steel was created. Lakshmi Mittal's family owned 88 percent of the company, which was based in Rotterdam but managed from London by Mittal and his son Aditya. In 2005, Lakshmi Mittal flew into Jharkhand, India to announce a $9 billion investment to build a greenfield steel plant with a 12 million tonnes per annum production capacity. In October, 2005, Mittal Steel acquired Ukrainian steel manufacturer Kryvorizhstal in an auction after a controversial earlier sale for a much lower price to a consortium including the son-in-law of ex-President Leonid Kuchma was cancelled by the incoming government of President Viktor Yushchenko. Two companies, Mittal Steel and Arcelor, bid against each other in $20-million increments all the way up to a final price of $4.8 billion. During the process, Lakshmi Mittal's son, Aditya Mittal, realized what the two companies could have achieved if they had been working together instead of competing with each other. At the same time, opportunities to expand by taking advantage of national governments’ sales of privatized or poorly-performing steel plants were beginning to disappear. Competition to buy smaller factories had raised the prices all over the world. It became evident that the steel industry would need to consolidate in order to remain competitive. On January 27, 2006, Mittal announced a $23.3 billion (€18.6 billion, £12.7 billion) bid for Arcelor. This move was one of the most controversial and publicized takeover bids in modern corporate history. Not only the business world, but national governments and European workers debated the wisdom of allowing an international company to take over the largest steel company in Europe. On May 19, 2006, Mittal increased its offer for Arcelor by 38.7 percent to $32.4bn, or $47.34 per share (€25.8bn, €37.74 per share). On June 25, 2006, Arcelor, announced in a board meeting that it had accepted a further offer ($50.68 or €40.4 per share) and the new company would now be called Arcelor-Mittal. Arcelor-Mittal is now by far the largest steelmaker in the world by turnover as well as volume, controlling 10 percent of the total world steel output. Today ArcelorMittal (Euronext: MT, NYSE: MT, BMAD: MTS, LuxSE: MT) is the largest and only truly global steel company in the world, with 310,000 employees in more than 60 countries. It ranks 39th on the 2008 Fortune Global 500 list. The company is headquartered in Luxembourg City, the former seat of Arcelor. In March 2008, Mittal was reported to be the 4th wealthiest person in the world, and the wealthiest in Asia, by Forbes Magazine, up from the 61st wealthiest in 2004 and up one place from thje year before. He currently resides in Kensington, London. In February, 2001, the steel companies Arbed (Luxembourg), Aceralia (Spain) and Usinor (France) merged to form Arcelor S.A., Luxembourg, the largest steel group in the world at that time, in a move to create a global leader in the steel industry by combining their technical, industrial, and commercial resources. Established in Luxembourg in 1882, Societe Anonyme des Hauts Fourneaux et Forge de Dudelange merged with two affiliated companies in 1911 to form Arbed. In 1922, Arbed created Cia Siderurgica Belgo-Mineira in Brazil. In 1962, SIDMAR was established in Belgium, and in 1985 it became the majority shareholder in ALZ. In 1992, Arbed took control of the Maxhütte (formerly in East Germany) to form Stahlwerk Thüringen. In 1995 it became the majority shareholder in Klöckner Stahl, now Stahlwerke Bremen. In 1997, Arbed entered a strategic partnership with Aceralia (formerly CSI) in Spain. In 1948, two steel-making groups, les Forges et Aciéries du Nord et de l'Est and les Hauts Fourneaux, Forges et Aciéries de Denain-Anzin, merged to form the French group Usinor. Sacilor originated as the Wendel Group, founded in the 18th century. Usinor and Sacilor expanded rapidly from 1950 until the early 1970s. During the economic and industrial crisis of the 1970s-1980s, successive waves of concentration in the French steel industry centered around these two companies. In 1981, the French government converted its loans to both companies into a majority stake in their capital. By 1986, the French government owned nearly 100 per cent of two medium-sized entities, Usinor and Sacilor, which competed against each other in many areas. To improve overall performance, the two were merged as Usinor Sacilor and withdrawn from the stock market. Through improved management and a focus on the top end of the market, the group again became competitive, and was privatized in July, 1995. The group adopted the name Usinor in June 1997. During the 1990s, Usinor refocused its product range on flat carbon steels and stainless steels and strengthened its position in Europe and overseas, particularly in Brazil, Thailand, the United States and Japan (through a strategic alliance with Nippon Steel). Aceralia of Spain was founded in 1902 when the blast furnace group, Altos Hornos de Vizcaya (AHV), was formed from the merger of three companies: Altos Hornos de Bilbao, La Vizcaya and La Iberia. AHV became the largest company in Spain; Bilbao had a long tradition of processing local iron ore and was a major seaport. In 1991, AHV was combined with the state-owned Ensidesa in the Corporacion de la Siderurgia Integral. In 1994, a successor company, CSI (Corporación Siderúrgica Integral), took control of its more profitable assets, and was reorganized in 1997 as Aceralia Corporación Siderúrgica. That same year, Aceralia was privatized and formed a strategic alliance with the Arbed Group to become one of the world's leading steel companies. Both Arcelor and Mittal originated from small steel-manufacturing companies and expanded internationally through the acquisition of numerous other steel plants, until their eventual merger. ArcelorMittal is an example of the consolidation taking place in many areas of industry today. Since the Industrial Revolution, steel production has been a factor in economic growth and a symbol of national strength. Many Europeans and Americans resisted the idea of allowing their steel production to come under the control of an international consortium. The steel companies themselves point out that they are responding to the globalization of the industries that consume steel, such as automobile manufacturers, ship builders, appliance manufacturers and construction companies. These industries now require steel products of a uniform standard to be made available wherever they are needed in the world. In order to remain competitive, manufacturers must make their operations as efficient as possible. By consolidating many individual steel producers under a single administration, Arcelor Mittal is able to provide a broad range of products and qualities to match the needs of its customers. Excessive manufacturing capacity in one country can be redirected to fulfill the demands of another area. Products can be manufactured where the cost is lowest and then shipped to where they are needed. Successful innovation from one factory can be implemented worldwide. Redundant research and development work can be eliminated, and engineering costs lowered as resources are shared. Many manufacturing plants can use a single marketing structure, and the speed with which products are supplied to customers can be increased. Consolidation and globalization have been facilitated by the growth of the Internet, which makes information immediately available worldwide. After the merger in 2006, ArcelorMittal faced considerable challenges coordinating the work of 300,000 employees in 60 countries, reconciling cultural differences, and establishing a system of communications. ↑ 1.0 1.1 1.2 1.3 Annual Report 2007 .. ArcelorMittal Retrieved October 23, 2008. ↑ BBC News, ArcelorMittal sees profit up 40%. Retrieved October 23, 2008. ↑ International Iron and Steel Institute, World Steel in Figures. Retrieved October 23, 2008. ↑ CNN Money, Global 500, Our annual ranking of the world's largest corporations. Retrieved October 23, 2008. ↑ Boston.com, Luxembourg drops law change in Arcelor bid battle. Retrieved October 23, 2008. ↑ Arcelor Mittal, Products & Services, Steel Services Centres. Retrieved September 30, 2008. ↑ Yahoo Finance, Arcelor Mittal. Retrieved October 23, 2008. ↑ Web India, Personalities in India - Personalities abroad—Lakshmi Mittal. Retrieved December 12, 2008. ↑ 9.0 9.1 Ispat International, Consolidating European Operations (2005). Retrieved October 23, 2008. ↑ Industry Week, A Global Future? U.S. steelmakers are intrigued—at least by joint-venture possibilities. Retrieved October 23, 2008. ↑ World Steel, World Steel in Figures, International Iron and Steel Institute (2006) Retrieved October 23, 2008. ↑ The Guardian, Mittal announces bid for rival Arcelor. Retrieved October 23, 2008. ↑ 16.0 16.1 Arcelor Mittal, Our History Retrieved December 29, 2015. ↑ Arcelor Mittal, Chronology of Arbed. Retrieved October 23, 2008. ↑ Arcelor Mittal, History of Usinor. Retrieved October 23, 2008. Bouquet, Tim, and Byron Ousey. Cold Steel: Britain's Richest Man and the Multi-Billion-Dollar Battle for a Global Industry. London: Little, Brown, 2008. ISBN 9780316027991. Cooney, Stephen. Steel: Price and Policy Issues. CRS report for Congress, RL32333. Washington, D.C.: Congressional Research Service, Library of Congress, 2006. Levich, Brian. Steel in the New Europe: The Impact of Globalisation, Accession & Environmental Policy. London: Metal Bulletin Research. 2004. Surie, Gita Sud de. 2008. Knowledge, Organizational Evolution, and Market Creation: The Globalization of Indian Firms from Steel to Software. Cheltenham, UK: Edward Elgar. 2008. ISBN 9781847204561. This page was last modified on 22 November 2016, at 21:16.